Therese Dolan, who has been interim dean of the Tyler School of Art at Temple since January 2008, has announced that she will be stepping down to return to the faculty on June 30, 2009. Robert T. Stroker, dean of Temple's Boyer College of Music and Dance, will serve as Tyler's interim dean, effective July 1. "Terry Dolan has guided the Tyler School of Art during a momentous period of the school's history," said Temple President Ann Weaver Hart. "The challenges of the Tyler School's move to Philadelphia were extraordinary, and Terry navigated them with grace. The creative energy of the students and faculty working in Tyler’s spectacular new studios is the most fitting tribute to her leadership as interim dean." 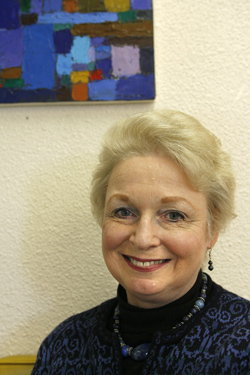 An authority on French impressionism, Dolan has been a member of the faculty of Tyler's Department of Art History since 1980 and has served two terms as department chair. She won the Great Teacher Award, Temple's highest honor for teaching excellence, in 2006, and a Christian R. and Mary F. Lindback Award for Distinguished Teaching in 2002. Dolan has authored two books, Inventing Reality: The Paintings of John Moore (1996) and Gavarni and the Critics (1981), and has written numerous articles in refereed scholarly journals. She is currently working on Artworks of the Future: Manet, Wagner and Liszt, a book that will explore the relationship between art and music in 19th-century France. "It has been an honor to serve as interim dean of the Tyler School of Art," Dolan said. "Working with President Hart and Provost Staiano-Coico provided a model of integrity, leadership and inspiration. I look forward to returning to the classroom and interacting with Tyler’s dynamic students. With the Jack Wolgin International Prize in the Fine Arts, along with the magnificent new building and its state-of-the-art facilities, Tyler is poised for greatness." Tyler moved into its new facility, designed by award-winning architect Carlos Jimenez, earlier this year. The 234,000-square-foot structure provides faculty and students in the studio arts with 40 percent more usable space than Tyler's old facility in suburban Elkins Park. It also offers four times the amount of gallery space, access to new methods for materials handling and ventilation, the largest greenspace at Temple's Main Campus, secure storage space, new opportunities for interdisciplinary artistic collaboration and a fulcrum for greater community outreach.